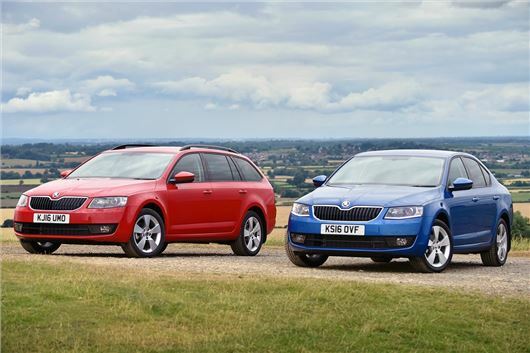 Skoda has added two new trim levels to the Octavia line-up. SE Sport and SE Technology both add plenty of extra equipment over SE trim, but with a relatively small premium. Both of the new trim levels are available in hatchback or estate body styles and are available to order now, priced from £19,990 for the SE Sport. SE Sport comes with 17-inch alloy wheels, xenon headlights, LED running lights and tail lights, a sport multi-function steering wheel, navigation, in-car WiFi capability and cruise control. It’s available with wither a 110PS 1.6 TDI diesel or a 150PS 1.4 TSI petrol engine, both of which can be optionally paired to a DSG. SE Technology features navigation, WiFi capability, adaptive cruise control, front and rear parking sensors, auto lights, auto wipers, chrome back and double-sided boot floor. It’s available with a 110PS 1.6-litre TDI or a 150PS 2.0 TDI, the former of which can be specified with a manual or DSG, or as a more economical Greenline III. Opting for the Greenline version lowers emissions from 99g/km to 90g/km, but it does come at the expense of adaptive cruise control, which is replaced by standard cruise control. The SE Sport is priced from £19,990 - £950 more than the SE, but with more than £3000 of extra equipment. The SE Technology costs £275 more than SE but adds £1830 of extra equipment. Full pricing is below.